Sorry husband, you lucked out in the housewife stakes. Just like everything planning and scheduling makes anything easier and ensures you get it done. Instead of trying to rush around in one day and do all of your house work set 1-2 tasks for each day across the week that way everything still gets done, you can do it in between or after work but it doesn’t seem like a HUGE overwhelming task. Have this schedule somewhere you can see it each day like at your desk to make sure you get these items completed. This hack I have stolen from my hubby who has been insisting I do this for ages to avoid having to iron and fold so much. Instead of hanging on line with pegs hang straight to a coat hanger to avoid extra creases and also cut time as you can grab them once they’re dry and put them straight away. This works so well for all my hubby’s work shirts, tee and my dresses and things that are easily creased. The less things you have in your space means less clutter and less mess. Every few months go through the toys in the playroom and clear out ones the kids have out grown and donate to charity, regularly clean out your wardrobes, linen cupboards and the kitchen pantry and those kitchen drawers full of bits and pieces of tupperwear. Declutter your surfaces in kitchens and bathrooms. Not only will your spaces be easier to keep tidy but they will feel so much cleaner and less stressful without all the things everywhere. If you can afford to, invest in your appliances around the home. Spend the extra money to save you the time and stress. With so many amazing appliances that can make life easier like LGs Twin Wash washing machine which you can connect to your smart phone and start a wash and/or dry to be completed by the time you’re home from work or the ability to do two loads at once you can save so much time and effort. By investing in high quality items (if you can afford to of course) they will last longer, be more durable and have better warranty periods. It’s OK to not be a super human at everything and to admit you need some help – you can outsource some some help if you need. These days you can get house cleaners at such a reasonable prices but if a cleaner is out of the budget why not assign some tasks to your partner, older kids or even the neighbours kids who will help for a smaller fee! I love this idea I saw on Pinterest ages ago. Chuck your kids dirty toys in the dishwasher on a quick wash to get them hygienic again because we all know every toy ends up on the floor but also in toddlers mouths. Since posting on Instagram my new “Twin Wash” washing machine I have been asked so many questions and had to so many people waiting to hear my feedback on this incredible washing machine. 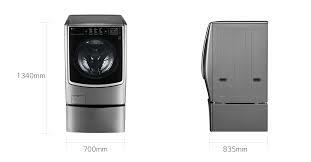 LG’s Twin Wash washing machine is a top if the line double loading washing machine and dryer combination. It is the first double load washing machine in Australia. The top machine is a HUGE front loader and dryer and the bottom one is a mini load drawer perfect for your smaller loads or everyday loads of active or work wear. It also has smart phone connection so you can start your loads while you’re away from home – amazing. The top loader is a HUGE 16kg washing machine and dryer – it’s the biggest load size you can get in a home washing machine before you go into commercial grade washers. I LOVE this because it means we can basically do all of our weeks washing at once! The bottom mini load drawer is a small 2.5kg but is perfect for your daily active wear loads, work clothes or delicate items. We also always tend to have a super small load of whites so we use the drawer for that. Because you need more space for air flow the dryer is 9kg capacity which means if you do a full load in the top you may have to remove some items and hang out or do 2 drying loads. There is an indicator on the machine to tell you how far you can fill for drying. Does it both wash and dry? Yes, the top washing machine (only) does both very effectively. 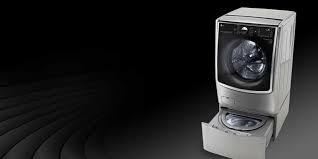 Our last LG washing machine was also a dryer but wasn’t the most effective at completely drying. This is a top of the line washing machine and an investment starting from $3500 but it is 2 washing machines and a dryer. Unfortunately it will not fit in every families budget but if you have the budget to do so it is worth the money. Don't forget lots of electrical stores offer great no interest deals so you can pay these bigger pieces off over time. LG has a 2 year warranty on parts and labour and an extra 8 years parts warranty on the Inverter Direct Drive Motor. This washing machine is big so if your laundry is small I would definitely check it will fit easily first. Although it is large you will save space on have a dryer as well. What I love most about this machine has got to be the ability to do 2 loads at once and also have the top load dry if I choose too. Because of the massive capacity of the top machine this is such a time saver for our busy lifestyle as we can just do all of our washing for the week on one day and if we need to in between use the mini drawer for our active wear or Millie’s one million daily outfit changes. Would I recommend this washing machine? Absolutely but it has a high price point and is an investment so one that you would need to consider if is right for your family and budget but the functionality and quality is amazing. Hope you enjoyed reading this article and if you have any more questions or your own house work tips head to my Instagram and comment on the post for this blog. Ill be happy to answer and other questions where I can. Now if they could just invent a washing machine that also folds and puts the colthes away that would be awesome... please and thanks LG. For more information on LG twin wash head to LG’s Website HERE or even send this article to your husband and tell him how a happy wife = a happy life.